Radiographs of the hand are used to evaluate patients who present with penetrating or blunt trauma, hand infections or hand pain of unknown cause. For example, patients with suspected metacarpal fracture are should have a standard hand series consisting of posteroanterior (PA), oblique and lateral views. However, patients with phalangeal fractures are best evaluated with PA, oblique and lateral views of the affected ray or rays, because these digital films allow more precise assessment of phalangeal fracture anatomy. Technical details of the standard hand series are described below. 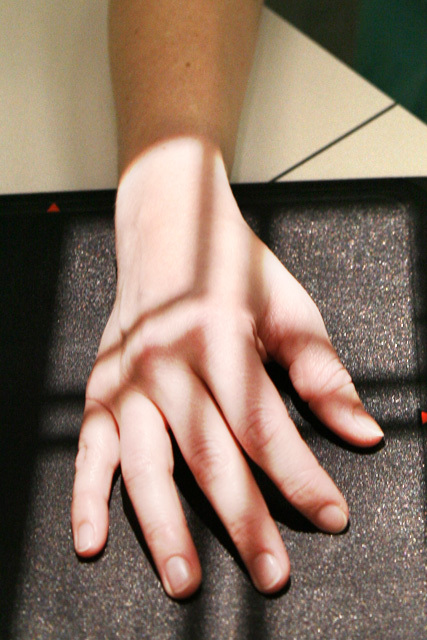 Position – Patient is sitting with palm placed flat on the x-ray cassette. Fingers are extended and slightly spread apart. X-Ray Beam – Centered at the middle finger metacarpophalangeal joint (MCPJ) and directed posterior to anterior and perpendicular to the cassette. Demonstrates – Metacarpal and phalangeal fractures, arthrosis of the small joints of the hand. Position – Patient is sitting with forearm in neutral rotation and ulnar border of hand placed against the x-ray cassette. The fingers are supported on a sponge and should be spread apart to avoid overlapping. X-Ray Beam – Centered at the index finger MCPJ and directed radial to ulnar and perpendicular to the cassette. 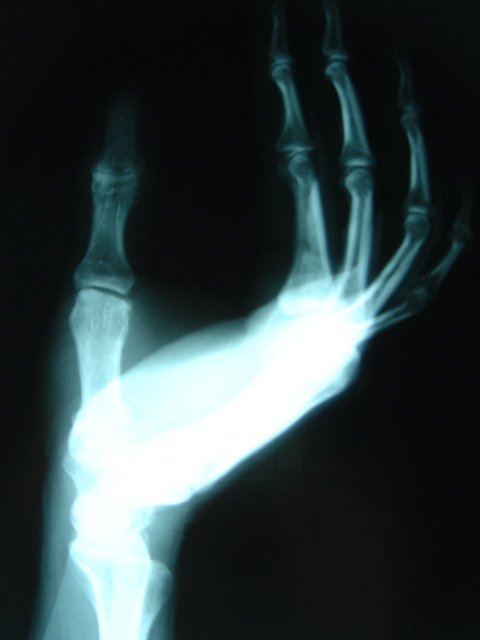 Demonstrates – Phalangeal fractures, small joint dislocations and arthrosis. 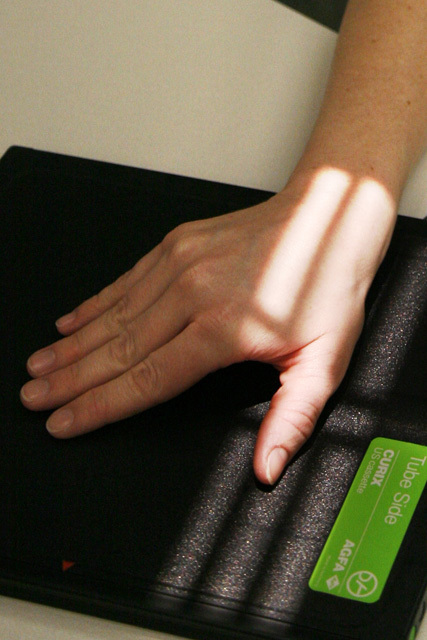 Position – Patient is sitting and hand positioned as for PA hand view. The radial side of the hand is rotated 45-degrees away from the cassette. The fingers are extended, spread apart to avoid overlapping and supported on a sponge. X-Ray Beam – Centered at the middle finger MCPJ and directed posterior to anterior and perpendicular to the x-ray cassette. Demonstrates – Metacarpal fractures (which are not well seen on the lateral view due to overlapping of the metacarpals), the scaphoid-trapezoid-trapezium articulation (may show arthrosis in older patients). Standard thumb series radiographs are taken to evaluate patients who have sustained thumb trauma or who may have thumb arthritis. This set of films includes hyperpronated anteroposterior (AP), oblique and lateral thumb views. Technical details of these radiographs are contained in the following paragraphs. Position – Patient is sitting or standing, whichever is more comfortable. The forearm is maximally internally rotated (hyperpronated) so that the dorsal aspect of the thumb rests on the x-ray cassette. Fingers are extended away from the thumb to avoid overlapping. 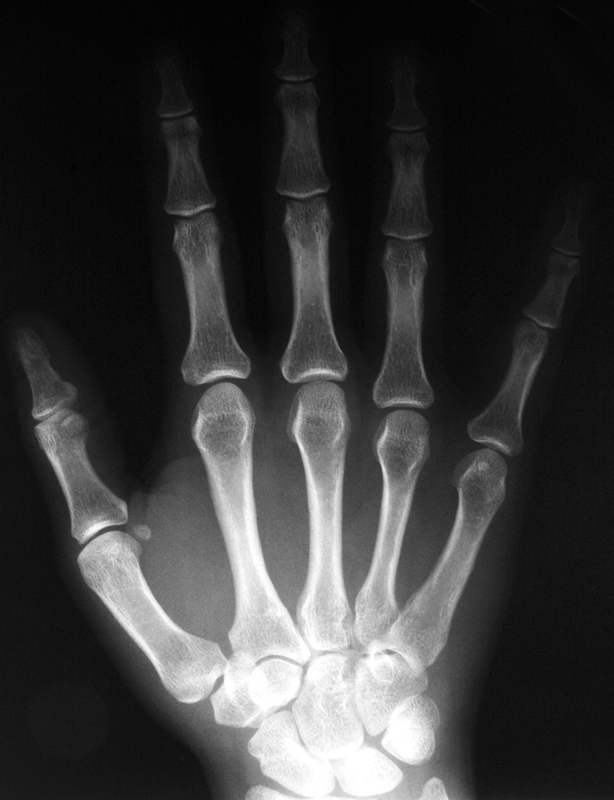 X-Ray Beam – Centered at the thumb metacarpal directed anterior to posterior and perpendicular to the cassette (or tilted slightly about 10-degrees cephalad). Demonstrates – Thumb fractures, trapeziometacarpal joint (TMCJ) arthrosis. 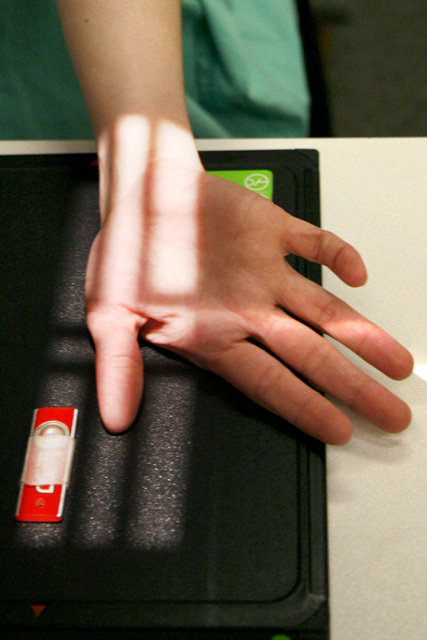 Position – Patient is sitting with thumb overpronated so that the radial border of the thumb rests on the x-ray cassette. 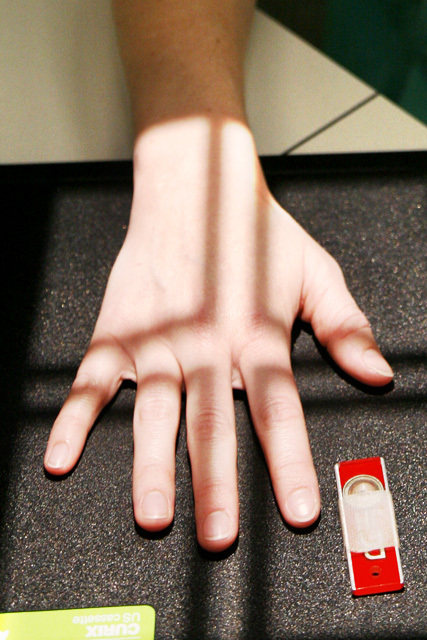 X-Ray Beam – Centered at the thumb MCPJ and directed perpendicular to the cassette. Demonstrates – Thumb metacarpal or phalangeal fractures or dislocations, arthrosis along the thumb ray. Position – Patient is sitting with palm resting on x-ray cassette. Demonstrates – Thumb fractures and arthrosis. Stress PA view of the thumb is helpful in evaluating patients who have sustained MCPJ ulnar collateral ligament injury (gamekeeper’s thumb). If the thumb MCPJ opens on the ulnar side with the application of radial-directed stress, then ulnar collateral ligament tear is confirmed and operative repair may be indicated. 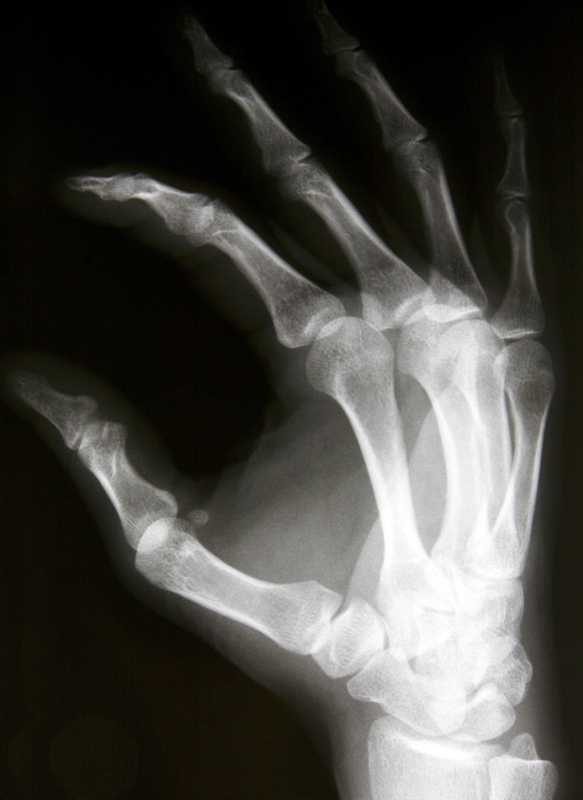 Advanced imaging techniques such as MRI or CT scan are rarely needed to evaluate common orthopaedic problems of the hand.